Online search functionality should feel seamless. Type what you’re looking for, and watch it appear instantly—like magic. No stumbling through category hierarchies or landing pages; just fast, accurate, search results pointing you to exactly what you want. Unfortunately, ecommerce search isn’t quite there yet. 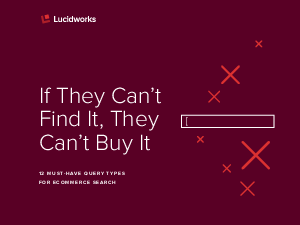 Download this eBook to learn 12 must-have query types to optimize your organization's eCommerce search.